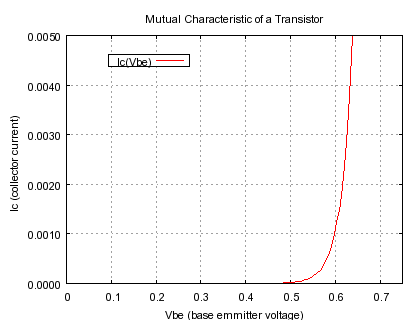 If we look at base voltage vs. collector current plot we can see that at approximately 0.7V on base to emitter junction, the BJT starts rapidly conducting. 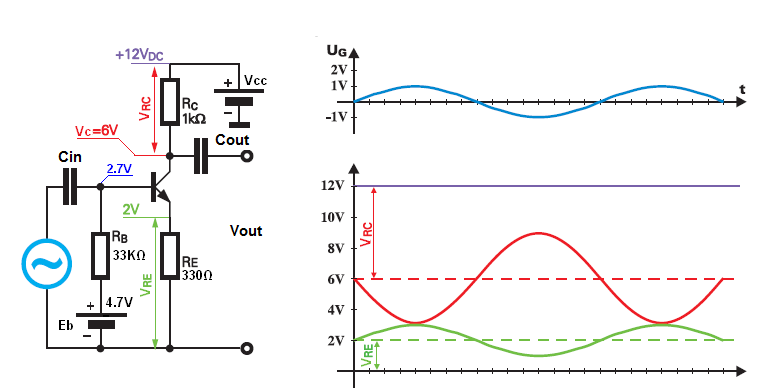 In a circuit DC BJT is biased so that quiescent point is in the middle of the load line (for class A amplifier). Does DC quiescent point represents reference point for the AC input signal? If we want to normally amplify input signal (without distortions), does the input signal have to vary from 600mV to 750mV (approximately)? Yes. If you have time try to analysis this simple CE amplifier. Where Vcc = 12V; Vc = 6V (red plot); Ve = 2V (green plot) ; Vinput = 1V (blue plot). DC quiescent point is Vb = 2.7V; Ve = 2V; Vc = 6V; Ic = 6mA; Ib = 60μA. No the AC input signal voltage will "modulate" our DC operating point the in the rhythm of the input signal. So we have a situation: Eb delivers 30uA, base needed 90uA, so that extra current (60uA) will (must) be "deliver" by AC voltage source Vin. So Vin will be deliver (sourcing) 60uA of a current. But we only need 30uA for the base current to "deliver" 3mA at emitter. But Eb delivers 90uA so that extra current (60uA) must flow to Vin (must be sink by Vin). As you can see everything falls into place. No, the input signal don't have to vary from 600mV to 750mV. Because the input coupling capacitor provide necessary DC-offset (DC level is shift thanks to Cin capacitor). And if Vbe is increased by about 60mV the collector current will increase his value ten times. Also BJT is a highly nonlinear device, so distortion will always occur. And this is why almost no one uses a single CE stage anymore. 1: Yes. At least, the signal at the base; see 2. 2: No. Yes. Sort of. To elaborate, a BJT must be biased into the appropriate mode of operation, and then your AC signal is typically capacitively coupled into it; this effectively just overlays your AC small signal on top of the DC that the bias network provides. It should be noted, however, that amplifying 'without distortion' is not going to happen. There's going to be distortion no matter what; the question is how much. The operating point has 1mA Collector current, because emitter current is ~ 1mA, because we have ~~ 2 volts across R5. We have 2 volts across R1. assuming a 10MegOhm||10pF scope probe is the load. Because of the linearizing effect of 100_Ohm in emitter, at 1mA Ie, we can swing nearly +- 100mV before "serious distortion" occurs. Look up the writings of Willy Sansen, on computing bipolar distortion and the IP2 and IP3 values. You can extend his math, for a linearizing resistor. Assume the input distortion Intercept Points are 2 volts rms. What is the input random noise floor? Ignore the large Cmiller, and just use the Collector F3dB; 2K ohm and 20pF = 40 nanosecond, 25Meg Radians, or 4Mhz. Assume our noise density is set by 'rbb' of 2N3904, assumed to be 1Kohm. Noise density is 4 nanoVolts/rtHz. Total input referred noise is 4nV * sqrt(4Mhz) = 4nV * 2,000 = 8 uV rms. SPDR (spurious free dynamic range) is 2 volts rms / 8uV rms, or 250,000 or 108dB. Not the answer you're looking for? Browse other questions tagged amplifier bjt npn input or ask your own question. 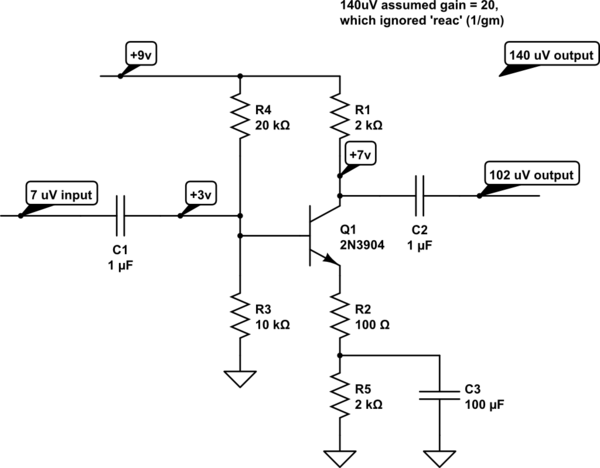 How can emitter bias amplify since the emitter current is fixed? What is the gain of this n-MOS transistor?